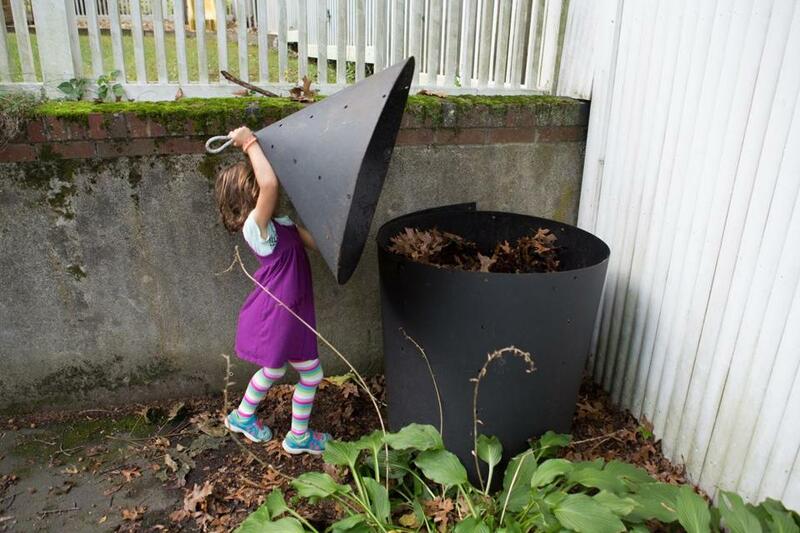 Abby Edelstein, 5, closed the lid on her back yard compost pile in Newton. When John Furst, a long-married man, finds himself alone in the kitchen, he sometimes gets a little naughty. He throws fruit and vegetable waste into the trash can. “I’m not as religious about composting when she’s not here,” said Furst, of Newton, referring to his wife of 31 years, Amy Cody. Furst, a former co-owner of Johnny’s Luncheonette in Newton Centre, claimed to feel guilty, but then copped to tossing out a bag of rotting bok choy, resisting family entreaties to fish it out of the garbage and put it in the compost bin, where it belonged. And so it goes, as composting — whether by households or by municipalities — inches its way from the green edge into the mainstream. Bins of decomposing material are becoming the source of pride, obsession, angst, and, sometimes, tension. To enthusiasts, composting seems like magic. Microbes, worms, insects, and fungi decompose organic material aerobically, turning coffee filters and potato peelings and old newspapers into nutrient-rich soil over a period of months. But what one person sees as a beautiful way to reduce the amount of trash we produce, or to make great garden soil, another sees as an invitation for rodents and fruit flies, a stinking rotten mess, one more chore. The composting movement is fueled by a desire to divert waste from landfills, and a growing interest in not just where food comes from, but where it ends up, said Andy Brooks, the founder of Jamaica Plain’s Bootstrap Compost, a service that charges customers $8 a week to pick up their food scraps, and also does scrap pickups from on-trend weddings and bar mitzvahs, among other events. “The thoughtfulness about eating organic or local has attached itself to the end cycle,” he said. The interest in residential composting can be seen in Boston and Cambridge, which are expanding pilot composting programs, and in Somerville, which is studying the economics of a limited curbside pickup pilot program. The state has also stepped up; rules now prohibit large businesses from disposing of food waste. At Harvard, after a composting pilot for the 2013-14 school year, dorm room décor for all incoming freshmen now includes compost buckets along with trash and recycling cans. And in Newton, Grant Berman, a 17-year-old composting entrepreneur has built a business — Dirty Boys Composting — that is charging novices $125 for a starter program. The fee includes delivery and installation of a rodent-resistant composter, a red wiggler worm infusion, follow-up checkups, phone and e-mail support, and emergency visits if the compost starts to fail — meaning it refuses to decompose into dark, rich soil. That’s usually a problem caused by too much wet foodstuff, Berman said, and not enough odor-eating leaves or shredded newspapers. “There usually isn’t a pile so bad you can’t bring it back,” he said. 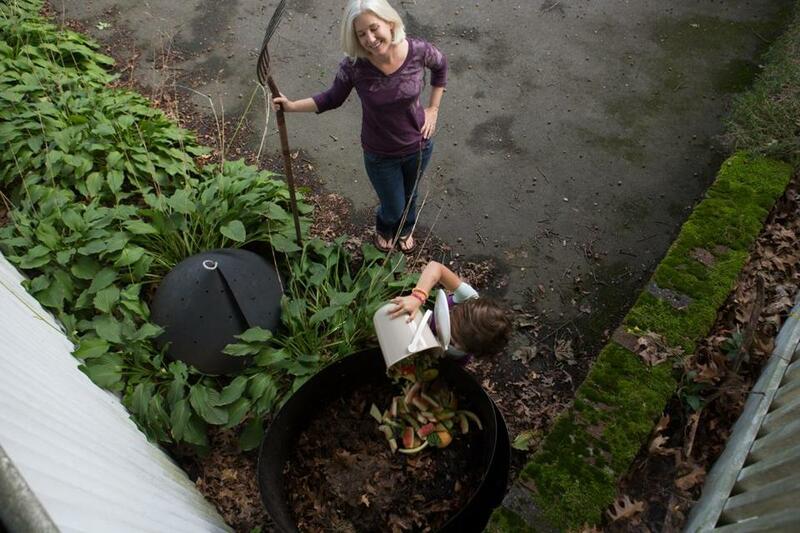 Sarah Birkeland (rear) and her daughter, Abby Edelstein, mixed waste food into their backyard composter. One client, Sarah Birkeland, had such success with her backyard composter that not only did her daughter’s preschool class take a field trip to their house to watch her husband mix it with a pitchfork, but the kids began sending their discarded banana peels and apple cores home with her daughter. That was great until the Friday afternoon when Birkeland forgot to empty her little girl’s purple polka-dot backpack. “By Monday it was really smelly,” she said, as if it were a positive. Katie Ulman, a coordinator at a South End hair salon, sounds pained when describing her unsuccessful attempts to get her boss to compost the mounds of trimmed hair the salon sweeps up every day. “Oh my god, your dirt could be so gorgeous with that,” she said. But for many, composting remains an environmentally friendly step they are not eager to take. Metro Pedal Power runs a food scrap pickup business called SoilCycle — it’s $35 a month for weekly pickup, by bike — but sometimes the business gets called by people who need an entire compost pile carted away. Meanwhile, in Boston, where many people don’t have room for a compost bin of their own, the city has installed community bins, in East Boston and the North End, with more planned for Brighton, Dorchester, and Jamaica Plain. Daniel Nee, the city’s compost facilitator — and a self-described composting “novice” who admits to thinking his wife was “nuts” when she composted years ago — says the program is more popular than he anticipated. With 178 individuals and families participating, the city collected 6,600 pounds of compost from June 12 to Aug. 28. The compost goes to Rocky Hill Farm, in Saugus. On a recent Thursday evening, the attractive North End bin, in the parking lot of the Nazzaro Center, attracted little notice from families gathered for a goodbye party. Correction: In an earlier version of this article the Nazzaro Center was misspelled.